In what critics are calling a gross waste of scarce law enforcement resources, California Aaron Sandusky, of G3 Holistics, received a ten-year federal prison sentence Monday for growing and distributing the legal California herb. The 43-year-old Rancho Cucamonga resident ran three Inland Empire clubs known as G3 Holistics and served 17,000 patients. 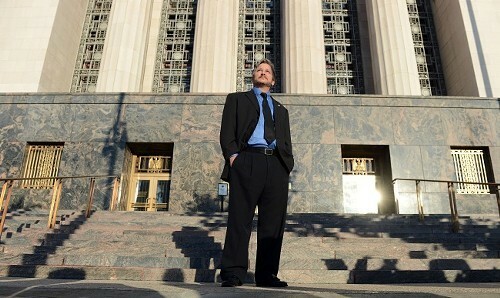 US Attorneys charged that he grew more than 1,000 plants, and profited from their sale. Medical marijuana is legal in California with a doctor's note, as is growing it in a collective, but it remains illegal under federal law. President Obama has said prosecuting lawful pot patients should not be a priority for the Department of Justice, but that marijuana businesses are fair game. A fifteen-month crackdown on them in California has closed hundreds of storefront collectives. Sandusky was one of the few who didn't respond to written threats from the government. He was arrested in June, 2011. Judge Anderson gave Sandusky the minimum sentence possible under federal guidelines, and said his hands were tied due to mandatory minimum sentencing guidelines. Sandusky has started a petition at WhiteHouse.gov to request a presidential pardon. Sandusky's lawyer will appeal the conviction as well. Judge Anderson recommended Sandusky serve his time in a federal cage in Victorville.